In a world of increasing IT specialization and new megatrends like cloud computing it becomes more and more important that you can count on reliable partners – be it for the requirement of a product (e.g. you need a new software tool) or a service (e.g. you want to outsource in-house activities) – or a combination of both. Please allow me to give you a formal guidance on how to choose the right vendor. There are several extensive publications around which touch this topic – this blog article focuses more on presenting you with a comprehensive end-to-end view and practical tips, mainly on avoiding typical mistakes, which can easily jeopardize the whole selection process. In a nutshell it goes like this: A) Define Requirements (What do you expect from the service/product), B) Request for Proposal (Ask potential vendors to respond to your requirements) and finally C) Evaluate Responses and make your choice. It’s important to follow such a structured approach, not only to make sure that at the end of the process you get what you originally wanted, but also to make it transparent to your internal stakeholders why you have made this choice and not a different one. First of all it makes sense to form a project team of people that have a common interest in the vendor selection process. Together with this team you have to define the requirements to the product or service. Generally speaking (this step could be a book on its own) it makes sense to make the difference between functional and non-functional requirements if you look for a product, or to further define a service specification including service levels if you are looking for a service requirement. The goal of this step is to get a first short list of vendors, for which you want to start a Request for Proposal (leading to step 3). Scan the market for possible vendors that could match your requirements. Sometimes this can be very easy – in case the players in the market are well-known. In other instances this might be more difficult, for such cases specialized market research companies can be a good help or alternatively look for an independent external consultant, which has done similar vendor selections already before. Last but not least google it, it can give you answers to almost everything you are looking for. If you require additional information from vendors to be able to create a short list, you might perform a so-called ‘Request for Information’ (RfI). The purpose of this step is not only to get an evaluation based on objective criteria, it’s purpose is also to avoid political games and minimize human emotions, which can happen in this phase very often. With a PoC you can check the vendor’s actual capability to deliver and on top of this it is also a good instrument to get an overall impression of the vendors and check the ‘soft factors’. This is why I always recommend to include – whenever possible – a PoC in the selection process. If you choose to do so, you should mention this in the RfP, including the time when you will issue the PoC Scenarios to the vendors. Now it’s time to make your choice. The base for this should be the evaluation sheet (-> step 4). Based on the results from the PoC you might also revise some of the scores (-> step 5). 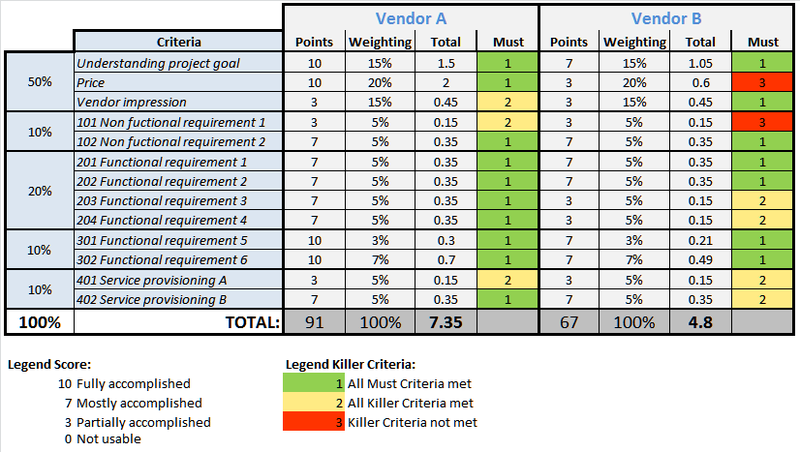 Look at the total scores and the killer criteria and make a ranking of the vendors. In practice it happens often that they are close together and in this case the price and general vendor impression will be the determining factor. A common mistake is to judge a vendor solely on the proposal. But did you also consider the capability of the vendor to deliver and can you imagine working with him? Does the vendor make the impression to go ‘the extra mile’ with you? Are there signs that he really wants to win the bid? These factors should not be underestimated, and a Proof of Concept (Step 5) can be a good instrument to judge this. On top, I recommend that you include this as a ‘Killer Criteria’ in your vendor evaluation sheet. From a vendor perspective the selection process is like a race (with only one winner) and any information advantage should be avoided to make sure it becomes a fair race. Intentionally or not, communication indiscretion (like giving a vendor information about the competitor’s price offering) can jeopardize the whole process and severely harm your credibility. My tip: In case a vendor contacts you during the selection process to get an information advantage: Guard your tongue. This can become a typical situation if you didn’t formulate your RfP well enough. In case you don’t give exact instructions in the RfP what the proposal structure should look like, you will be faced with a situation where every proposal will come in a completely different form and can make it really hard for you to compare them. Or if in the RfP unclearly formulated requirements leaves room for interpretation, the vendor responses will be based on different assumptions, which worst case will make your response evaluation useless and you can start from scratch again. Sehr interessanter Beitrag zum Thema Providerauswahl im IT Outsourcing. Danke dafür! We are in a process of vendor selection in the sector of Information Technology. I have read several articles to optimize our process. I find this article very good that can help in developing a better process for our system. It is clear and suggesting quantifiable methods. Thanks a lot and thumbs up! Is there a downloadable template for the sample scorecard?